I made this for several challenges. 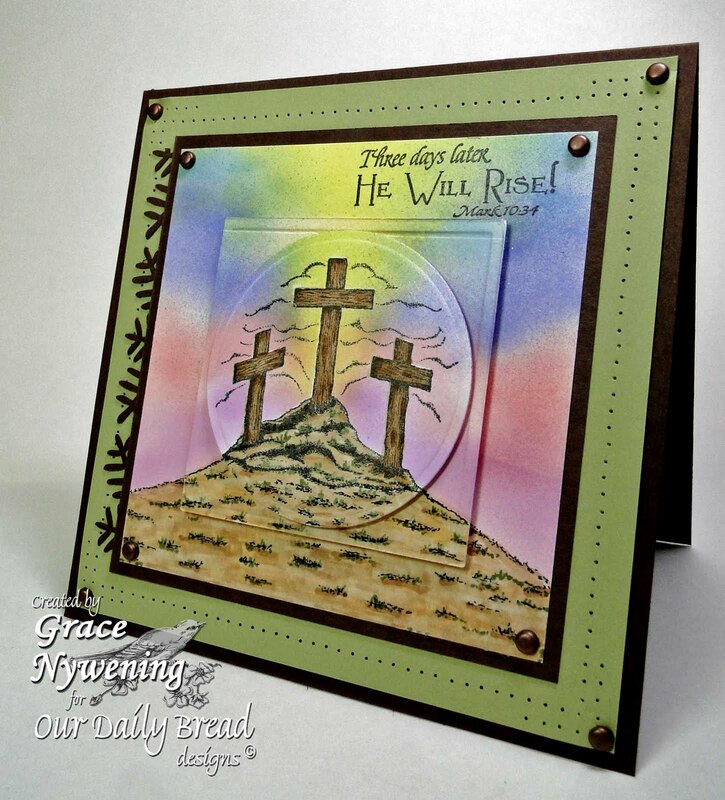 Angie over on Christian Papercrafts Magazine is challenging us to a rise/shine theme. For the rise part I chose this new stamp set from Our Daily Bread designs called He Will Rise. I used the sketch from Sunday Sketch & Stamp . I used my Spellbinder's Grand Calibur to cut my circles (Spellbinders Standard Circles Small) and the inner square (Spellbinders Classic Squares Small). I love cutting more than one shape at a time with the Grand Calibur... something I never could do with any other machine. I stamped the image with Memento ink and colored with Copics. I then airbrushed the various layers. I popped up each layer on thin foam dots. I pierced around the frame, and added brads, thinking of the nails that pierced the Savior's hands and feet. For the punched element of the sketch I used my MS Pine Bough punch, because I thought it looked a bit like the thorns of the crown they placed upon His head. My base is Papertrey Dark Chocolate, the matting is SU! Pear Pizzazz. What a wonderful card. Love your great colours. Thanks for playing with us over at FFC this week. Grace, this is stunning! I love how you did this with the circle and squares. I really enjoy following your blog -- you do such beautiful work! This card is gorgeous (as always) and I love the layering you did. And rise He did! This is absolutely beautiful. Thanks for joining us at SFC, good luck. Beautiful card, thanks for joining us at Do You Stack Up. This is sooooo GORGEOUS Grace, LOVE the scene you created sweetie, absolutely STUNNING!!!!!!! I hope you are having a WONDERFUL Friday! Big Hugs! such a wonderful card! thanks for playing along with us at TPV! oh how beautiful! Thanks for playing along with us at TPV! Gorgeous card! Your coloring is just amazing! Thanks so much for joining us at Stamptacular Sunday this week! Hi Grace: What a beautifully awesome creation, in so many ways! I love everything about your card... thanks for sharing with us at For Fun Challenges this week! beautiful card! Thank you for playing at IDIC this week! We hope to see you again next week! This is beautiful Graace! Thank you for playing along with us at Penny's this week. Good Luck! Beautiful! I can see how much thought has gone into making this card. I love the paper-piercing, and immediately thought of the vrown of thorns when I saw the pine bough border (before I had even read your post!) Thanks so much for sharing it with us at FOR FUN challenges this week. This is gorgeous Grace!! I just love your colors and the airbrushed background!! Gorgeous Easter card my friend. Love the blues and greens. What a comfort to know that the meaning behind these images is so much more than "pretty" but the gift of our salvation! TFS! Thanks for playing along with us @ For Fun Challenges. beautiful card! thanks for playing the critter challenge. This is a beautiful card. I love the image. Thank you for joining us at Penny's Challenges. Ohh wow great colours. Thanks for sharing with us at For Fun. What a super job you did on that card!!!!!!! This is fantastic!! I love the layers and beautiful coloring Thanks for joining us at Southern Girls! The Craft's Meow Grand Opening! ODBD Mar 1 Release Blog Hop!